Next time you visit Disney in Orlando, Florida, look up in the sky – you may well see the latest attraction based at Downtown Disney Waterside – a giant helium balloon which will take you soaring above the park to a height of 400 ft, in absolute silence. Unlike traditional hot air balloons, which require constant use of the burner to keep them aloft, this balloon is simply tethered, and when released, rises quietly into the air, until it reaches the end of its leash. Operated by Aerophile, who are the world leaders in captive balloons, this one has a volume of 210, 000 cubic feet, and is the newest and largest one they have produced. Its diameter is 72 ft, whilst its circumference is 240 ft. 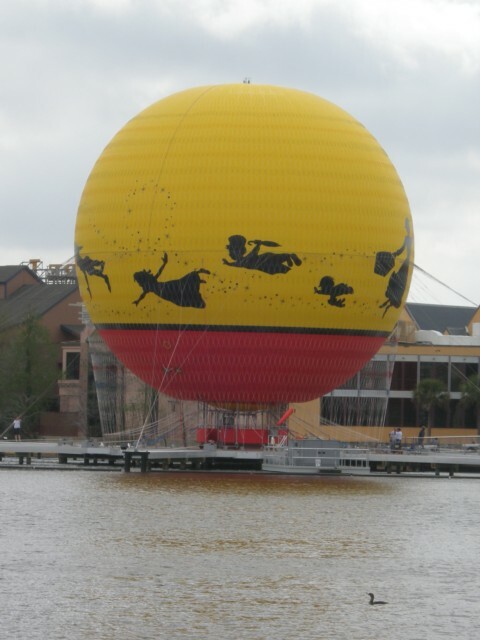 The actual height of the balloon is 105 ft, and it lands on a platform which was specially designed for Downtown Disney. Aerophile was founded in 1993 by Jerome Giacomoni and Matthieu Gobbi, who reinvented the tethered gas balloon, which had not been around for 80 years. This company is now the world leader in tethered gas balloons, and they have sold them in over 20 countries, in cities such as Dubai, Singapore, Paris and Hong Kong. Of course, flying a tethered balloon is a highly specialist occupation, requiring scrupulous operating practises, but Aerophile have thirty staff including fifteen pilots and technicians, who install the balloons and train those who will operate them. Not all the balloons are used as amusement rides, some are used for advertising. However, the Downtown Disney balloon is designed to take up to 30 passengers on a mind-blowing and awe-inspiring trip suspended high above the parks. Called ‘Characters in Flight, ’ this huge tethered red and yellow balloon is very colourful, with silhouettes of various Disney characters, including Aladdin, Mary Poppins, Peter Pan, and Dumbo outlined on its surface. Guests climb into a large circular red gondola which is suspended below the balloon before being taken on a 10 minute ride, high above Lake Buena Vista, where they will get a birds' eye view of the surrounding area. Flights take place during the day and at night, when you might be lucky enough to see the fireworks, but they are dependent on suitable weather conditions. At night the balloon is lit up internally, and you will see it like a huge bright glowing orb hovering over Disney. High winds mean that the number of guests allowed to fly at one time is reduced. Some weather conditions will make flights impossible for safety reasons. The ascent and descent is slow, and takes about 2 minutes each way. Guests are asked to hang onto a safety rail as it can be a little bumpy. There is a safety net above the waist-high wall of the gondola, but you can still take photos as the holes are quite large. Once airborne, the flight lasts around 5 or 6 minutes, and is peaceful, with little movement. You can move around the gondola to take photos, although when full to capacity with 30 people it will be a tight squeeze. It is not possible to pre-book a ride as weather conditions are a major factor in whether the balloon takes flight. As far as safety goes, this is, of course, paramount. Should the tethering cable break, which is highly unlikely , and the balloon was therefore set free, there is a safety valve which kicks in at 1, 000 ft releasing the helium until the balloon is simply floating. The pilot would then begin a controlled descent. Flight is operated on a ‘first come, first flies’ basis. The cost for adults is $16, and for children just $10 and tickets can be bought from a new booth, formerly an Information Booth, situated near Disney Quest. For those, like me, who would love to do a balloon flight but are too scared to do a real one, this would seem a great opportunity. I can’t wait to try this out! Viewed 3544 times since 26 April 2009.